It is essential to treat Lyme disease early because if you miss the diagnosis, it can lead to severe long-term health complications and disabilities. Undiagnosed Lyme disease can cost the NHS thousands. Do you want to learn more about Lyme disease? Take the RCGP Lyme disease module – it’s a free, 30 minute online-module and worth 0.5 CPD points. It contains information on epidemiology, aetiology, clinical manifestations, investigations and treatment. Lyme disease is a bacterial infection caused by species of the spirochaete, Borrelia. 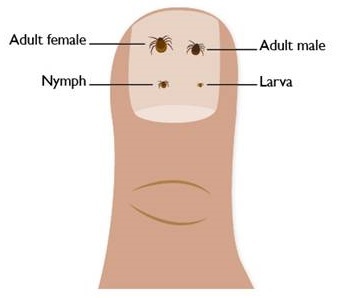 It is most commonly transmitted through the bite of an infected tick but congenital transmission is possible. More research is needed into other forms of transmission. Ticks can be found throughout the UK in the countryside but also in urban parks and gardens. Ticks can be as small as a poppy seed so some bites can go unnoticed. They also carry other infections known as co-infections. The World Health Organisation states there are at least 90,000 cases of Lyme disease in Europe each year and it’s on the rise. An EM rash will not be present in every case (approximately ⅓ patients will not experience the rash). EM rashes can also be atypical in nature and are not always the classic bulls-eye shape. Some rashes are mistaken for cellulitis and ringworm. Symptoms can be fluctuating and migratory in nature. So how else can you identify Lyme disease? Lyme disease can spread throughout the body causing more, widespread symptoms which can migrate and fluctuate, including cardiac issues, a wide range of cognitive dysfunction (e.g. word finding issues and memory loss), gastrointestinal issues, depression and anxiety, encephalitis, vision issues, seizures and tremors. See an example of a comprehensive symptom list here. Lyme disease can present differently in each person and can be more difficult to diagnose in children. Sudden changes in mood, sleeping patterns and concentration can be key indicators in younger patients. The current testing for Lyme disease is flawed and cannot rule out the disease. Any patient presenting with an EM rash should be treated immediately, without the need for a blood test. If you do test, it is important to note that it can take 4-6 weeks for antibodies to develop after a bite, if at all. If a patient has an EM rash, start antibiotic treatment right away. If Lyme disease is highly suspected based on other symptoms and history, start antibiotic treatment before test results become available. A lot more research is needed on effective treatment protocols for Lyme disease, and some patients may need more treatment than others. Unfortunately, there are many people in the UK with Lyme disease who have been misdiagnosed or undiagnosed. This has led to costly investigations and prolonged suffering. To read about the effects of untreated Lyme disease please visit our blog section and read our patient stories. Lyme disease can cause serious illness and disability if left untreated. There are many Lyme disease patients living with the consequences of late-stage, chronic Lyme disease due to a delay in treatment. You can help us to prevent this happening to your patients, friends and family, by encouraging people to protect themselves from tick bites, learn correct tick removal techniques and teaching others about Lyme disease. Please visit the LDUK downloads area to find printouts, or email us for an awareness pack or leaflets to be sent out to you.